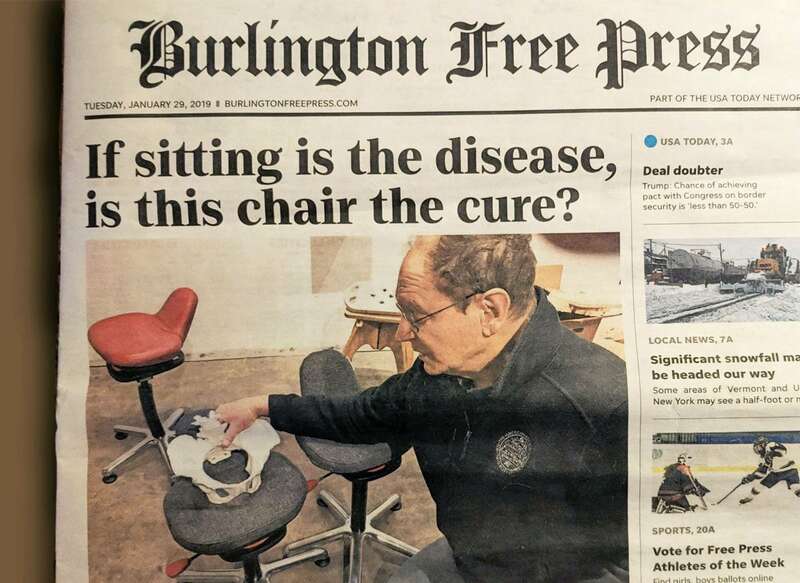 Sitting passively in the posture imposed by Western chairs has been clearly associated with the epidemic of back pain that ultimately afflicts 80% of Americans. But back pain is really the lesser of the problems associated with sitting. It turns out our Western chairs not only force us to sit poorly, they also force us to sit still, and of the two problems, sitting still creates by far the more serious issues. Although sitting poorly leads to self-limited episodes of low back pain, sitting still distorts human biochemistry so profoundly that it has been dubbed “sitting disease”. The constellation of obesity, diabetes, heart disease, non-alcoholic liver disease, as well as some forms of cancer, and increased all-cause mortality have now been definitively linked to prolonged passive sitting. So our addiction to Western chairs isn’t just hurting us; it’s literally killing us. The problem is so profound that it has spawned the meim “Sitting is the new smoking”, a threat to our health and survival able to hide in plain sight because sitting passively in Western chairs is assumed to be our normal resting position. Actually, chairs have only very recently become our default position, and now we are finally discovering just how bad a bargain they’ve turned out to be. It was initially hoped that simply getting adequate exercise at the gym would protect against sitting disease, but counterintuitively, this simply isn’t true. It turns out the problem isn’t lack of exercise, the problem is sitting still per se. Yes, exercise is good for everyone, but it simply can’t undo the problems caused by sitting still many hours each day. What about standing instead of sitting? It was also hoped that standing desks could simply replace sitting at desks. Unfortunately, because standing desks aren’t comfortable for everyone they won’t be everybody’s solution and moreover won’t be anybody’s best solution: a recent paper in the American Journal of Public Health found that heart attack rates were twice as high for people at standing desks compared to a control group in standard Western chairs. This result was unexpected and hasn’t yet been well explained, but it seems clear that standing desks aren’t likely to be the solution simply because standing isn’t the opposite of sitting. As far as our biochemistry is concerned, moving is the opposite of sitting. Standing is just another stress posture that our anatomy rebels at. Constant movement is the missing ingredient. So, what’s to be done? Well, returning to a hunter gatherer lifestyle with constant physical activity is the obvious choice, but isn’t practical for most of us. It’s the 21st century and there’s no turning back. Our jobs, our recreations, our transportation, our very architecture, all require that we sit, and sit many hours each day. The solution that may work for most of us is to simply making sitting active, rather than passive. A variety of chairs are now available that encourage sitting actively, allowing, even requiring, continuous readjustment of posture, resulting in spontaneously perfect posture and increased metabolic rate. Because active sitting is a relatively recent addition to sitting options, it hasn’t been well studied, but early research suggest that metabolic rate increases by 17%, and anecdotal reports suggest improved posture and decreased back pain. Active sitting is perhaps best thought of as an adjunct to spinal health, used as prophylaxis against back pain and sitting disease. Although it has not been studied, it is unlikely that active sitting has a role in the therapy of an acute attack of low back pain. Active sitting will be of greatest interest to patient who are subject to intermittent episodes of low back pain, but will likely also to be of interest to patients who simply wish to add more activity to their chair-centered jobs. As the meme “Sitting is the new smoking” gains traction, sitting actively may become the way we all sit.